Thordon Bearings Inc., a manufacturer of seawater lubricated bearings for the global marine industry, has questioned the rise of environmentally acceptable lubricants (EALs) in oil-based stern tube seals and bearings, stating the industry can use “the most environmentally safe lubricant” there is: seawater. The U.S. Environmental Protection Agency (EPA) is enforcing regulations introduced in December 2013 that stipulate that all vessels over 24 meters in length operating in U.S. waters must switch over to EALs in all oil-to-sea interfaces before their next drydocking. 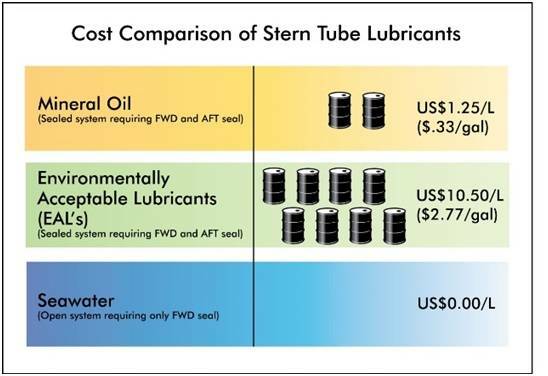 “But what is the point in shipowners investing in costly bio-lubricants when seawater is widely available and 100% free? It’s akin to paying for the very air we breathe,” stated Craig Carter, Thordon Bearings’ Director of Marketing and Customer Service. “When used in conjunction with Thordon Bearings’ COMPAC propeller shaft bearing system, seawater lubricates the bearings to ensure the smooth, effective and safe operation of the vessel. Not only do we guarantee our seawater-lubricated COMPAC system for a wear life of fifteen years, but it reduces a shipowner’s annual operating and maintenance costs substantially, compared to an EAL-lubricated metal bearing and two seal system,” Carter continued. In its recently published comparative research into the operational costs of using mineral oil, approved EALs or seawater in a propeller shaft bearing system, Thordon Bearings found that EALs – vegetable oils, synthetic esters and polyalkylene glycols – are over seven times more expensive than the mineral oils typically used in oil-lubricated propeller shaft bearing systems.